CHICAGO, IL – Yesterday, Governor Rauner outlined spending priorities in his proposed budget for the next fiscal year. While we were pleased that the Administration’s priorities include combating opioid addiction and addressing systemic challenges in access to mental healthcare, the overall proposed budget does not support these priorities. In fact, it undermines them. As this year’s state budget process gets underway, we call on the Governor and the General Assembly to work together to develop a responsible budget that fosters strong communities by investing in the public services that Illinoisans want and deserve, including mental health and substance use treatment services. Well-supported public services are the cornerstones of healthy, vibrant communities. The introduced budget would harm access to healthcare and human services by cutting funding for substance use prevention, mental healthcare, supportive housing, and Medicaid. Illinoisans deserve better. We are also alarmed by the Governor’s proposal to cut state revenue by rolling back tax rates. Returning Illinois’ income tax rate to near 2014 levels was a bi-partisan measure aimed at restoring fiscal stability and preserving vital programs. Even under current tax rates, Illinois does not generate sufficient revenue to support essential programs Illinoisans count on like healthcare, social services, and public education – the building blocks of strong communities. Illinois must maintain all current revenue sources to preserve support for needed public services. As communities across our state struggle to combat an unspoken mental health crisis and increasingly lethal opioid epidemic, ensuring access to treatment must be a top priority – now more than ever. The proposed state budget should support these priorities in more than name only. We urge Governor Rauner and the General Assembly to take the opportunity before them to design a state budget that reflects the priorities of Illinoisans and adequately and sustainably funds critical public services that equip our communities to stay healthy and thrive. 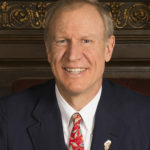 This entry was posted in News and tagged advocacy, budget, governor rauner, Illinois, mental health, mental illness, press release, public policy, twill. Bookmark the permalink.